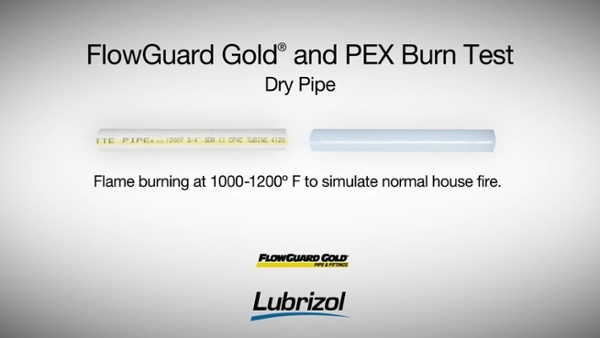 Burn & Fire Risk Ratings | Lubrizol Advanced Materials, Inc.
FlowGuard Gold® CPVC is self-extinguishing. When exposed to a normal house fire, FlowGuard Gold pipes and fittings will develop a char but will not make the fire worse by continuing to burn once the flame is removed. 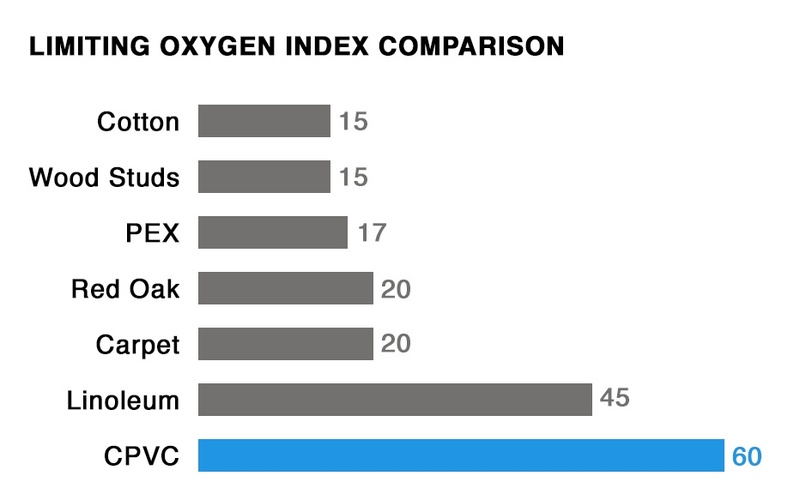 This is because FlowGuard Gold CPVC has a limiting oxygen index (LOI) of 60, meaning that it requires 60% oxygen in the air to sustain a flame. Other non-metallic plumbing materials have an LOI of less than 20, meaning they burn easily and sustain a flame in normal air. In fact, FlowGuard Gold CPVC can be used in the plumbing portion of a multi-purpose or passive purge fire protection system when combined with BlazeMaster CPVC. Third party laboratory testing of inhalation toxicity using the United States Testing - Pittsburgh Protocol - 12-8-89 shows that CPVC is no more toxic than a campfire. The Biological Services Division of the United States Testing Company, now SGS, confirms that the smoke from burning CPVC is comparable to the smoke from Douglas Fir wood. Caution: Inhalation of smoke from a house fire is never recommended, while CPVC will not significantly add to the toxicity of a house fire, other building products can produce more harmful smoke. FlowGuard Gold plumbing systems are joined using a solvent welding process meaning there will be no need for torches or flames during the installation. Copper tubing generally requires the use of a flame to solder joints, which creates a significant hazard during construction. In some cases that hazard requires a fire watch be present on the job site, adding cost and complexity to the work. If for any reason a fire is needed for other work in your home, you can trust the fire resistance of FlowGuard Gold pipes and fittings to minimize the risk of plumbing pipe ignition.